Susan Herbert, Lone Star “Dog Whisperer”, is always delighted for an opportunity to spread the word about the almost magical process of repairing people-pet relationships and stopping the insanity in households that have “gone to the dogs.” As a certified Level 3 Canine Specialist of America’s Canine Academy, Susan operates her dog-whispering business in the Fort Worth area and regularly transforms the lives of desperate pet owners whose adorable Christmas puppies have mysteriously turned into hounds from HELL. 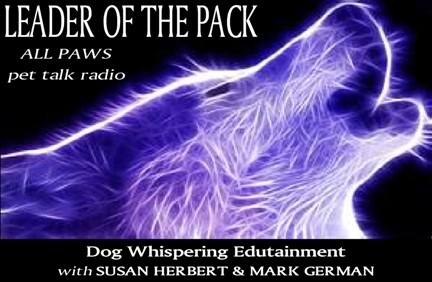 Susan Herbert, host of, Leader of the Pack Generous about sharing her knowledge of canine behavior and the sanity-saving habit changes that help frustrated owners rehabilitate their seemingly-crazy dogs, Susan is an articulate and patient “pack leader” who takes tremendous joy in stopping the madness & badness and keeping pups where they belong --- in their pet-friendly homes. In her quest to reduce adoption returns, she actively volunteers to educate new adopters by partnering with local animal shelters and rescue groups. Sharing the philosophy of her mentor, Mark German, Susan knows that the only way to change the dog; is to change what the human is doing. In their up-coming book, SHHH . . . Happens! ©, Mark and Susan will divulge the simple, make-sense steps to creating a calm, stable, and well-behaved dog. Susan serves on the board of directors for H4 - Hounds Helping Heroes Heal, a non-profit organization co-founded by America’s Canine Academy and America’s Animal Clinic. H4 pairs U.S. Military Veterans suffering from PTSD and TBI with Emotional Support Animals/Companion Dogs that are rescued from shelters and rehabilitated through the behavior modification program developed by Mark German.